Whether you choose to use them as table markers at your event or give them away as guest gifts, these chic black custom picture frames are perfect for your next celebration. 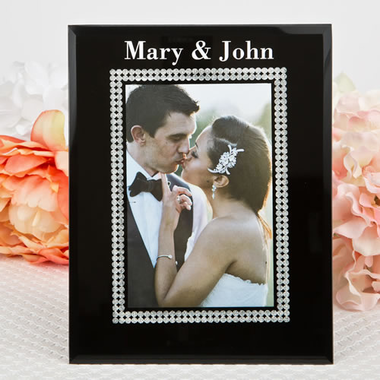 Party planners love to look for cheap black and rhinestone style decor and these frames can set a glamorous yet affordable flair. With glimmering silver details around the photo window and your text custom print, these gifts will be a great party keepsake for your family and friends. This is a black beveled glass frame measures 8 1/2"H x 6 1/2"W, has a sparkling silver inlaid inner border around the window to fit a 4"x 6" photo or other insert. There is a black velvet easel back with a hinge for easy insert of your photo. Each comes individually packaged in a white box.